Product prices and availability are accurate as of 2019-04-03 20:20:48 EDT and are subject to change. Any price and availability information displayed on http://www.amazon.com/ at the time of purchase will apply to the purchase of this product. 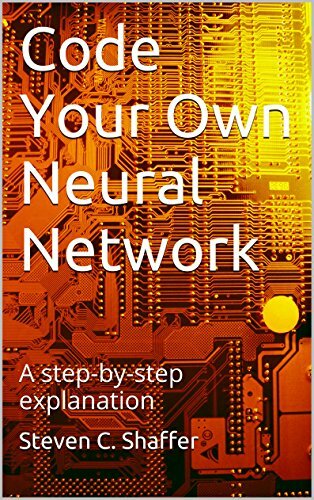 This mini-book will take you step-by-step through coding your own neural network. The language used is C++, although it’s really mostly C syntax. Once you have mastered the steps, it should be easy enough to translate your knowledge into most other languages. The book goes step by step through the development of a relatively simple 3-layer back-propagation neural network to solve the exclusive OR problem. The purpose is to explain the concepts from a code-literate standpoint. There are lots of text-heavy and math-heavy explanations of how neural networks work, but few code-centric explanations. The exclusive OR problem is a good example because this cannot be solved with a single-layer neural network. If you are a coder, the explanations should make sense to you. No explanations of C++ syntax are given, so this is not for the novice programmer. This book is not for the purist or the researcher, it’s an introductory book for people who want a basic understanding of how neural networks work.